There's something about this cereal that bugs me. 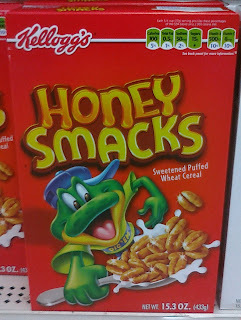 I think it's the word "smacks," along with the hip sideways cap, that does it. It's like some masked and derogatory drug/racial/urban youth reference, as if Dig 'Em is down in the hood. Dig 'Em used to be more "white bread," something out of a froggyland Leave It to Beaver. I can see Wally eating these. 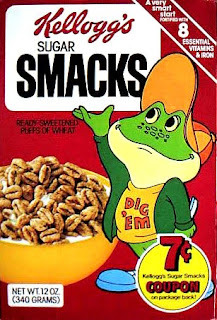 I guess we should just be glad Honey/Sugar Smacks doesn't look like this anymore. Nothing like good old fashioned nightmare fuel to get your morning going. 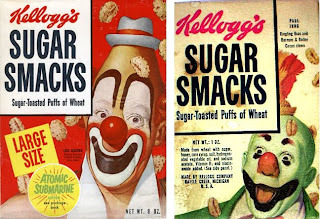 I'd say that clown on the bottom right has had one sugar smack too many.